<code>task1</code> and <code>task2</code> functions are confined to the scope of the <code>createWorker</code> function. There’s nothing like performance tuning your website and watching benchmarks better themselves. Sometimes it can be tricky but fortunately this is one of the easier fixes. YSlow and Chrome Dev tools recommend gzip compression and you are looking at around a 70% reduction in file size for your static and dynamic resources. Great! So how do we do it? First of all this blog post applies to IIS7 and above. 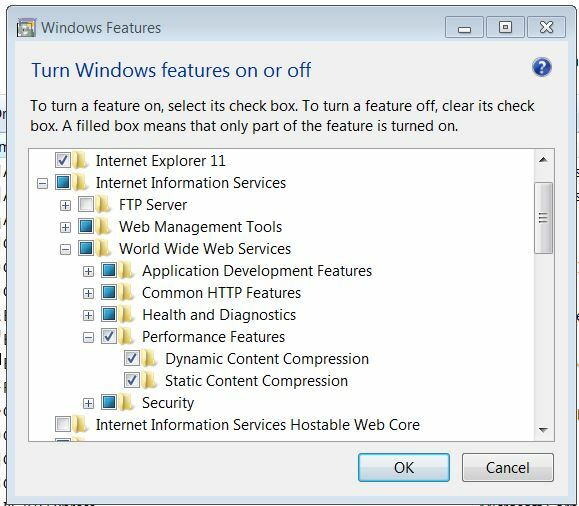 IIS7 has Dynamic Content Compression un-installed so install it by heading to Windows Features.